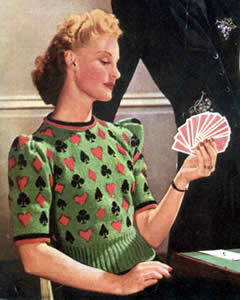 This is a wonderful period jumper from 1940. I often thought I might try and adapt it but never made a decision as to how. Recently a friend on the internet borrowed the pattern to make it "as is" - quite an undertaking with all that patterning. She wanted to make it for a local Poker Club - but, as I explained, this is a Bridge Jumper - no playing poker in it mind! So here is the pattern as it appeared originally - I will include any notes and advice from our test knitter if and when they are forthcoming. These are the instructions as they appear in the original pattern. They are untested with modern yarn and needles. 1st row (right side facing): Knit 8 in main shade (G), * 3 in black (B), 13G, 1 in red (R), 13G, repeat from * to last 11 stitches, 3B, 8G. 2nd row: Purl 9G, * 1B, 14G, 1R, 14G, repeat from * to last 10 stitches, 1B, 9G. 3rd row: Knit 9G, * 1B, 13G, 3R, 13G, repeat from * to last 10 stitches, 1B, 9G. 4th row: Purl 6G, * 2B, 1G, 1B, 1G, 2B, 10G, 3R, 10G, repeat from * to last 13 stitches, 2B, 1G, 1B, 1G, 2B, 6G. 5th row: Knit 5G, * 3B, 1G, 1B, 1G, 3B, 8G, 5R, 8G, repeat from * to last 14 stitches, 3B, 1G, 1B, 1G, 3B, 5G. 6th row: Purl 5G, * 9 B, 8G, 5R, 8G, repeat from * to last 14 stitches, 9B, 5G. 7th row: Knit 5G, * 9B, 7G, 7R, 7G, repeat from * to last 14 stitches, 9B, 5G. 8th row: Purl 6G, * 7B, 7G, 9R, 7G, repeat from * to last 13 stitches, 7B, 6G. 9th row: Knit 6G, * 7B, 6G, 11R, 6G, repeat from * to last 13 stitches, 7B, 6G. 10th row: Purl 7G, * 5B, 7G, 11R, 7G, repeat from * to last 12 stitches, 5B, 7G. 11th row: Knit 7G, * 5B, 7G, 11R, 7G, repeat from * to last 12 stitches, 5B, 7G. 12th row: W: Purl 8G, * 3B, 8G, 4R, 3G, 4R, 8G, repeat from * to last 11 stitches, 3B, 8G. 13th row: Knit 8G, * 3B, 9G, 2R, 5G, 2R, 9G, repeat from * to last 11 stitches, 3B, 8G. 14th row: Purl 9G, * 1B, 29G, repeat from * to last 10 stitches, 1B, 9G. 15th-20th rows: Work in stocking stitch in main shade only. 21st row: Increase in first stitch; knit 8G, * 1R, 13G, 3B, 13G, repeat from * to last 10 stitches, 1R, 8G, increase in last stitch. 22nd row: Purl 10G, * 1R, 14G, 1B, 14G, repeat from * to last 11 stitches, 1R, 10G. 23rd row: Knit 9G, * 3R,13G, 1B, 13G, repeat from * to last 12 stitches, 3R, 9G. 24th row: Purl 9G, * 3R, 9G, 2B, 2G, 1B, 2G, 2B, 9G, repeat from * to last 12 stitches, 3R, 9G. 25th row: Knit 8G, * 5R, 7G, 4B, 1G, 1B, 1G, 4B, 7G, repeat from * to last 13 stitches, 5R, 8G. 26th row: Purl 7G, * 7R, 6G, 11B, 6G, repeat from * to last 14 stitches, 7R, 7G. 27th row: Knit 6G, * 9R, 5G, 11B, 5G, repeat from * to last 15 stitches, 9R, 6G. 28th row: Purl 6G, * 9R, 5G, 4B, 1G, 1B, 1G, 4B, 5G, repeat from * to last 15 stitches, 9R, 6G. 29th row: Increase in first stitch; knit 6G, * 7R, 7G, 2B, 1G, 3B, 1G, 2B, 7G, repeat from * to last 14 stitches, 7R, 6G, increase in the last stitch. 30th row: Purl 9G, * 5R, 10G, 5B, 10G, repeat from * to last 14 stitches, 5R, 9 G.
31st row: Knit 10G, * 3R, 10G, 7B, 10G, repeat from * to last 13 stitches, 3R, 10 G.
32nd row: Purl 10G, * 3R, 10G, 1B, 10G, repeat from * to last 13 stitches, 3R, 10G. 33rd row: Knit 11G, * 1R, 12G, 5B, 12G, repeat from * to last 12 stitches, 1R, 11G. 34th row: Purl 11G, * 1R, 13G, 3B, 13G, repeat from * to last 12 stitches, 1R, 11G. 35th-40th rows: Work in stocking-stitch in G only, increasing at each end of the 37th row [115 stitches]. These 40 rows form the pattern. The chart shows the 40 rows written out above. Continue in pattern, increasing at each end of every 6th row, until there are 125 stitches on the needle, and the 32nd row of the second pattern has been worked. Continuing in pattern, cast off 5 stitches at the beginning of the next 2 rows, then decrease at each end of the next 5 rows (105 stitches). Continue in pattern without shaping until 3rd pattern is completed. 1st row: Knit 6G, 3B, 13G, 1R, 59G, 1R, 13G, 3B, 6G. 2nd row: Purl 7G, 1B, 14G, 1R, 59G, 1R, 14G, 1B, 7G. 3rd row: Knit 7G, 1B, 13G, 3R, 18G, (slip these stitches on to spare needle); cast off 21; knit 18G, 3R, 13G, 1B, 7G. 4th row: Purl 4G, 2B, 1G, 1B, 1G, 2B, 10G, 3R, 18G. Continue in pattern, decreasing at neck edge on next and every alternate row until 36 stitches remain and the 15th pattern row has been worked. 1st row (wrong side facing): Cast off 10 stitches at armhole edge, purl to end. 2nd row: K2tog, knit to end. Repeat these last 2 rows once. Cast off. Return to stitches on the spare needle; join main shade wool at centre and work left shoulder to match right, shaping at opposite edges. Next row: Knit 6G, 3B, 13G, 1R, 13G, 3B, 14G, turn. Work on these 53 stitches for the right shoulder (slip remaining stitches on to a spare needle or stitch holder). Continue in pattern, omitting centre heart near back opening and keeping these stitches in main shade, until 4th row of 4th pattern has been worked. Shape shoulder as follows: cast off 11 stitches at armhole edge on the next 3 alternate rows. Cast off remaining 20 stitches. Return to stitches left on spare needle or stitch holder. Join main shade wool at centre, cast on 4 stitches for under-lap and work to match the right shoulder, shaping at opposite edges. With No 12 needles and main shade wool, cast on 73 stitches. 1st row: Knit 6G, * 1R, 13G, 3B, 13G, repeat from * once, 1R, 6G. 2nd row: Purl 6G, * 1R, 14G, 1B, 14G, repeat from * once, 1R, 6G. 3rd row: Knit 5G, * 3R, 13G, 1B, 13G, repeat from * once, 3R, 5G. 4th row: Purl 5G, * 3R, 10G, 2B, 1G, 1B, 1G, 2B, 10G, repeat from * once, 3R, 5G. 5th row: Increase in the first stitch; knit 3G, * 5R, 8G, 3B, 1G, 1B, 1 G, 3B, 8G, repeat from * once, 5R, 3G; increase in the last stitch. 6th row: Purl 5G, * 5R, 8G, 9B, 8G, repeat from * once, 5R, 5G. 7th row: Knit 4G, * 7R, 7G, 9B, 7G, repeat from * once, 7R, 4G. 8th row: Purl 3G, * 9R, 7G, 7B, 7G, repeat from * once, 9R, 3G. 9th row: Increase in the first stitch; knit 1G, * 11R, 6G, 7B, 6G, repeat from * once, 11R, 1G; increase in the last stitch. 10th row: Purl 3G, * 11R, 7G, 5B, 7G, repeat from * once, 11R, 3G. 11th row: Knit 3G, * 11R, 7G, 5B, 7G, repeat from * once, 11R, 3G. 12th row: Purl 3G, * 4R, 3G, 4R, 8G, 3B, 8G, repeat from * once, 4R, 3G, 4R, 3G. 13th row: Increase in the first stitch; knit 3G, * 2R, 5G, 2R, 9G, 3B, 9G, repeat from * once, 2R, 5G, 2R, 3G; increase in the last stitch. 14th row: Purl 24G, 1B, 29G, 1B, 24G. 15th-20th rows: Work in stocking stitch in main colour G, increasing at each end of the 17th row. 21st row: Increase in the first stitch; knit 8G, * 3B, 13G, 1R, 13G, repeat from * once, 3B, 8G; increase in the last stitch. 22nd row: Purl 11G, * 1B, 14G, 1R, 14G, repeat from * once, 1B, 11G. 23rd row: Knit 11G, * 1B, 13G, 3R, 13G, repeat from * once, 1B, 11G. 24th row: Purl 7G, * 2B, 2G, 1B, 2G, 2B, 9G, 3R, 9G, repeat from * once, 2B, 2G, 1B, 2G, 2B, 7G. 25th row: Increase in the first stitch; knit 5G, * 4B, 1G, 1B, 1G, 4B, 7G, 5R, 7G, repeat from * once, 4B, 1G, 1B, 1G, 4B, 5G; increase in the last stitch. 26th row: Purl 7G, * 11B, 6G, 7R, 6G, repeat from * once, 11B, 7G. 27th row: Knit 7G, * 11B, 5G, 9R, 5G, repeat from * once, 11B, 7G. 28th row: Purl 7G, * 4B, 1G, 1B, 1G, 4B, 5G, 9R, 5G, repeat from * once, 4B, 1G, 1B, 1G, 4B, 7G. 29th row: Increase in the first stitch, Knit 7G, * 2B, 1G, 3B, 1G, 2B, 7G, 7R, 7G, repeat from * once, 2B, 1G, 3B, 1G, 2B, 7G; increase in the last stitch. 30th row: Purl 11G, * 5B, 10G, 5R, 10G, repeat from * once, 5B, 11G. 31st row: Knit 10G, * 7B, 10G, 3R, 10G, repeat from * once, 7B, 10G. 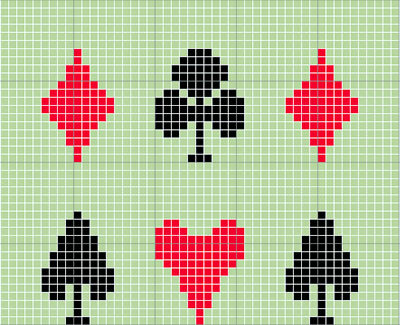 32nd row: Purl 10G, * 7B, 10G, 3R, 10G, repeat from * once, 7B, 10G. 33rd row: Increase in the first stitch; knit 10G, * 5B, 12G, 1R, 12G, repeat from * once, 5B, 10G; increase in the last stitch. 34th row: Purl 13G, * 3B, 13G, 1R, 13G, repeat from * once, 3B, 13 G.
35th and 36th rows: Work in stocking stitch in G [89 stitches]. Now shape top: work 4 rows in G stocking stitch, casting off 2 sts at the beginning of the first 2 rows, then decreasing at each end of the next 2 rows. Work 2 rows straight, then decrease at the beginning of the next 4 rows. * Work 2 rows straight, then decrease at the beginning of the next 2 rows. Repeat from * once. Work 16 rows straight, then decrease at each end of the next 2 alternate rows (69 stitches). Work 2 rows straight; decrease at each end of the next row. Now decrease at each end of every following 4th row, but when commencing the 3rd pattern, omit the heart at either end and keep stitches in main shade; continue until 16th row has been worked (59 stitches). Continue in G stocking stitch, decreasing at each end of every alternate row until 49 stitches remain. Next row: k2tog all along, ending k1. With No. 12 needles cast on 7 stitches in R and 7 stitches in B. 1st row: (p6, k1) in B, twist the threads, (k1, p6) in R.
2nd row: (k6, p1) R, twist the threads, (p1, k6) B.
Repeat these 2 rows until roll is required length. Cast off. Press all parts except ribbing on the wrong side under a damp cloth. Join side, shoulder, and sleeve seams. Set in sleeves, arranging fullness at shoulder. Sew stocking-stitch roll about 2 rows in from neck and sleeve edges, sewing along centre of roll, leaving the edges to roll under. Press all seams on wrong side. Make 3 chain, join in a ring, work 6 dc into ring. Work 2 dc in each stitch of last row, work 2 rows without shaping. Work 1 dc in every alternate stitch of last row. Stuff button with wool. Fasten off. Work 1 row of dc round back opening, making three loop buttonholes on right side of opening. Sew the buttons in position. Sew press-stud at extreme top of opening. Original materials called for: 12ozs Patons Super Bouclet. A pair each Nos 10 and 12 (3¼mm and 2¾mm) needles. Editor's note: The closure for the back opening uses 3 buttons and loops that are self-made using crochet, so you will need an equivalent size crochet hook for finishing. 28sts to 4 inches on No 10 needles. To fit 33-35 inch bust; length from top of shoulder: 20 inches; sleeve seam: 6 inches. increase: by knitting into the front and back of the next stitch. dc: double crochet - known as single crochet in the US. The tension and needle size for this pattern imply a standard 4 ply yarn would work. Given that bouclé yarn tends to work up fairly firmly, it might be possible to substitute a double knitting yarn to make a larger size. Editor's note: My experience of these vintage patterns leads me to suggest that you may need far more yarn than the quantities indicate. In some cases I have needed one 50g ball (which is actually 1¾ozs) to replace each 1oz ball.